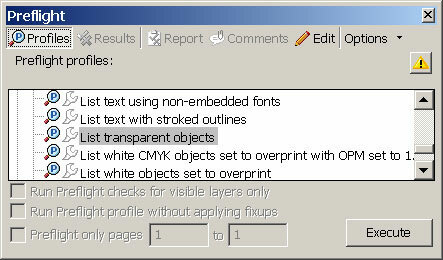 Transparency in PDF files refers to objects on a page, such as images or text, which are transparent or ‘show through’. It makes underlying image objects shine through, so it is useful for emulating glass, fog, varnish but also shadow. Adding a drop shadow to text or images is one of the most popular uses of transparency. It can be used to show parts of objects that are normally hidden from view. Transparency can be used to lighten (parts of) images so that the text on top remains readable. It can be used to create a tint of a certain color or mix colors. PDF 1.4 (the file format supported by Acrobat 5) was the first version of PDF that supported transparency. This PDF release came to market around the same time that Adobe Illustrator 9 was launched. Transparency was ‘the’ big new feature in that release. Other applications like Corel Draw had already supported transparency for years but had to resolve to a trick to generate a printable file: when creating an EPS file or printing a drawing, the application had to remove or calculate the transparency effects. This process is called ‘flattening’. Adobe also included transparency support in InDesign and they heavily promoted its use to the designer community. Suddenly prepress departments all over the world were flooded with designs that included transparency and their RIPs had to flatten this transparency to be able to make proofs or output plates. Transparency is a very complex technology. The Adobe technical documentation on it is over 100 pages long. To simplify things, applications tend to split up a page in small square areas, called atomic zones. The effect of transparency is then calculated for each separate atomic zone. The stitch between atomic zones can sometimes show up on-screen (and even in output) as thin white lines. Another stumbling block is the fact that a PDF file can contain transparent objects with different color spaces. Adding a drop shadow to a spot color element that sits on top of a CMYK background (or vice versa) is an example of a design that challenges the RIP or workflow that needs to process the job. Making an RGB image slightly translucent on top of a CMYK background is another example. Issues with color handling can show up as color shifts in (part of) an image. Sometimes transparency involves the interaction between a vector based object, such as text, and a bitmap object, such as a digital photograph. Under some circumstances, software needs to partially convert a vector object to a bitmap. This is frequently the reason why text fattens up a bit on output. On top of all of this software applications needs to work out how to best handle groups of objects that are transparent. Should each object, in turn, be blended into the background or should it be done on the entire group? Older prepress systems can really slow down when they need to flatten transparency. Adobe was well aware of these issues. In 2006 they announced a complete rewrite of their RIP technology, called the Adobe PDF Print Engine (or APPE). It replaces the CPSI that was used in previous generations of RIPs and prepress workflows. As its name implies, APPE is much more efficient in handling PDF files that contain transparency. The original 1.0 release still had some issues but the version that is nowadays used in workflows from Agfa, Kodak or other vendors is pretty reliable. Ironically enough Adobe’s main competitor, Global Graphics, had already adapted their interpreter, called Harlequin, much earlier. Modern systems based on the latest versions of this product can also handle transparency without too much effort. Making an object transparent in a layout or design application (obviously). Adding drop shadows to objects. Placing native files which contain transparency from Adobe Illustrator, InDesign or Photoshop. Dragging & dropping or copying & pasting transparent objects from applications like Adobe Illustrator to Adobe InDesign. When do such transparent objects lead to a PDF file with transparency in it? PostScript does not support transparency. If a designer prints a file to PostScript and then uses Acrobat Distiller to convert this file to PDF, the resulting file will not contain any transparency. EPS files are PostScript files. They also cannot contain any transparency. PDF 1.3 files also cannot contain transparency. If a designer exports to PDF 1.3, the design application flattens the transparency. Only when the design application allows you to ‘Save’ or ‘Export’ to a PDF 1.4 or higher file format, can you end up with a PDF file that contains transparency. Other preflight engines like PitStop Professional can also be used to detect transparency. To designers, it is not always obvious when their files contain transparency. InDesign has a very nice mechanism for this. Pages that contain transparent objects have a checkerboard pattern in the pages list. InDesign indicates this per spread, even if only one of the two pages contains transparency. In the example below page 2, page 3 or both pages contain transparency. You can download the Adobe designers guide to transparency here. Quark has a similar document for QuarkXPress 7 transparency. Adobe has produced an excellent white paper on the use of transparency in print production. That question does not have anything to do with transparency. Anyway: I am not aware of any automated solutions that can do this. If you have Adobe Acrobat Professional and an image editing program, you can configure Acrobat to edit the scans embedded in your PDF using the image editing application. Lots of work, but maybe part of cleaning up these scans can be done by filters or actions if you happen to use Photoshop. I think that I am having a transparency issue with Microsoft Visio and Acrobat Standard XI. I have created drop shadows on a couple of standard rectangular objects. When I create the PDF, the shadows are missing. Any other ideas on how to work around this issue? Sorry, but I am not an AutoCad user and cannot answer your question. I am trying to save photoshop files with transparent backgrounds as pdf but in each case I loose the transparency > can anyone help please? That would be because you cannot. PDFs are treated like paper documents in acrobat reader (and all the other readers I know of) – it will not appear transparent unless you leave it as an editable pdf and open it in Photoshop. It will be transparent in photoshop, but will never appear transparent in acrobat reader. Instead, everything transparent will show white in acrobat reader, though as long as it’s an editable pdf, all the transparent information will still be there when opened in the appropriate editing program. You can set Adobe Reader to show the page transparency by selecting “Show Transparency Grid” in Preferences. One lives and learns – I just gave this a try with Reader 9 (Edit > Preferences > Page Display category > activate ‘Show transparency grid’). The transparent background in the PDF is indeed marked using a checkerboard pattern. Hi..thanx for great info..But I still have a problem…I am trying to make a PDF from Allplan Nemetchek with Adobe PDF Creator…I have done everything that is explaned above,but I still can get parts of transparent objects..for example, parts of bushes under the trees…although they exists on original plan… Can someone help me?…. Thanks for the infos. I ran into the problem that my colors changed (from gray to blueish gray) in Acrobat Reader after I added transparency to a vector graphic created with pdfLaTeX and the PGF/TikZ package v2.0.